Yale Europe Materials Handling uses E-steering as standard for its ERP 15-20VT series three-wheel electric counterbalance forklift trucks, improving energy performance by 10% This allows operators to run a longer shift before having to change the battery and also improves driver comfort and reduces noise levels. 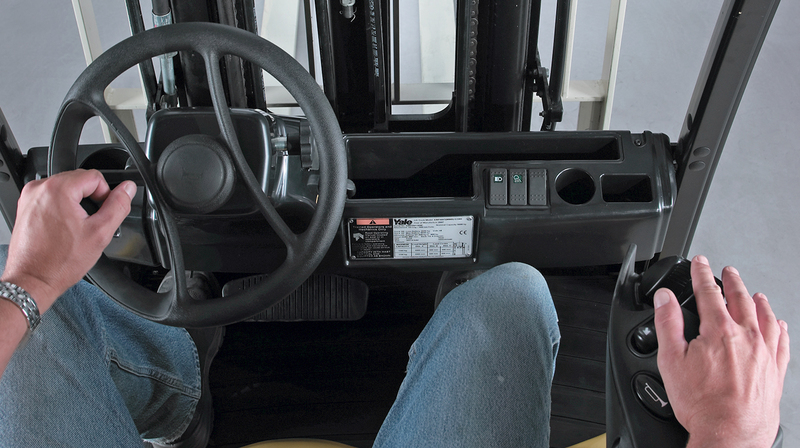 The introduction of E-steering has resulted in a quieter truck as the hydraulic pump does not run continually. Maintenance has also been improved as the number of hydraulic lines in the steer column has been minimised, reducing the probability of leaks. This entry was posted in 3 Wheel Electric Trucks, Automotive Industry, Batteries and Chargers, Corporate Responsibility, Design Process, Electric, Ergonomics, Food Sector, Innovation, Manufacturing Sector, Our Awards, Warehousing and Distribution and tagged 3-wheel truck, Awards, Cost Reductions, Cross-docking, Dependability, E-steering, Electric, Energy Consumption, Energy Efficiency, Innovation, Manoeuvrability, Materials Handling, Operator Confidence, People, Productivity, Products, Storage Rooms, Yale, Yale Europe Materials Handling. Bookmark the permalink.